The updates of the past two weeks should make it clear that we’re really pushing our engine and ourselves to deliver a siege experience that no other game can come close to! Last week, we were testing the scenario with a building of over nine million blocks and over 700 NPCs, more than one hundred of which were using an assortment of siege engines! On Monday morning, Mark and Ben were talking about the number of trebuchets in the scene. Mark asked Ben if we could really “up” the number of trebuchets in the scene. Ben then said, “you want me to put in 200 trebuchets?” And Mark, as I expected, responded with, “Yeah! Let’s see how far we can go!” The resulting mayhem was pretty awesome! I’m certainly very proud of what we’ve done and have continued to improve upon this week. Of course, there’s more to do, but this accomplishment, as Mark has said in previous updates, was really the last big technical hurdle for us. Mark grabbed some really good shots today, further showing off the building destruction as the Arthurians break through the TDD wall! And here’s a reverse shot of the Arthurians charging over the hill into the keep! Take note of the better-looking textures on the Arthurian armor in the foreground on Mark’s Black Knight. Before we completed the character 2.0 upgrade, we wouldn’t have even tried putting in that much detail! Pretty cool, huh? And, as mentioned, we’re continuing to improve not only the look of the game, but more importantly for us, the performance during these massive battles. We have a lot of changes/improvements/fixes scheduled for the next two weeks, so expect even better-looking, and ever more performant, sieges! One of the things we don’t talk about a lot is how efficient our engine is when it comes to the amount of bandwidth that it uses. Andrew likes to joke that you could play the game on a modem–but he’s right. 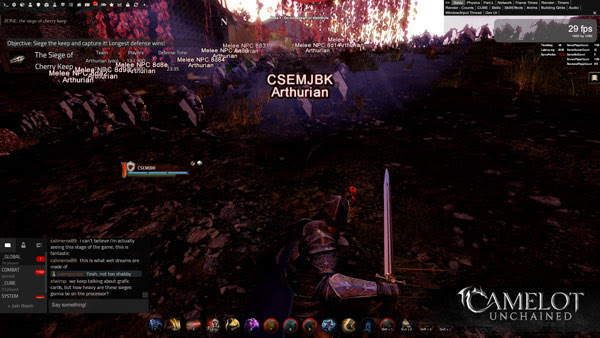 While that might not seem important in a world where people can stream 4K movies, when you want to make an MMO that people across the world can play, having an engine like ours is a powerful advantage for us. This week, several team members continued to work on the scenario, landing several improvements to performance around building destruction, rubble, and frame rate. The rest of the team continued to work on various other exciting features for CU, as can be seen below in our Top Tenish list, highlighting the work done this week! If you missed last’s week’s update, you can see a couple more more images of the castle destruction HERE. If you missed this week’s livestream with Mark, you can catch that HERE. In terms of testing, we are not planning on a weekend test. However, make sure and keep an eye on the tentative testing schedule next week, as we’ll have several changes coming in. We would appreciate our Backers’ help in finding bugs and providing feedback. Siege Scenario: Remember that “go big or go BSC” mantra we have here when we test our work? Right now, on Hatchery, we’re testing with that nine million plus block building, the 700 npcs, 200 trebuchets, 25 mortars, and 25 scorpions! The biggest increase was all those trebuchets, and the additional corresponding npcs firing them! a. Building Server: Andrew completely rebuilt the threading on the building server to improve performance, assisted by Rob and the addition of further metrics to find and fix bottlenecks. b. WIP – Tech – Building Destruction: Colin worked on synchronizing rubble creation with building destruction. This is not in a finished state, but players should see less of a delay between when damage is done to a building and when they see rubble generated. c. WIP – Building Mesh Simplification: Lee is working on the mesh simplification code for buildings in order to improve performance. He has this working “MUCH” better locally, and is hoping to commit soon. d. Hitching: Andrew is currently focused on addressing the hitching we’ve seen in our playtesting. 2. WIP – Tech – Crafting System: Christina started work on item sub part visuals (like a sword that looks different depending on what hilt item and blade item were used to make it). So far, this is just the networking part of things, so we can describe the items as having multiple resources/colors/materials. In the coming weeks, this will expand into both the client rendering and the crafting system. 3. WIP – Tech – Improved Ability System – Defenses: Caleb has submitted the updated version of armor penetration, armor class, and resists. 4. WIP – UI – Orders (Guilds): AJ has been working on the Order UI, and has begun hooking it up to the back-end. The UI will give players tools that they need to manage their Order in the game. 5. WIP – Tech – Abilities: Anthony spent the week working on bug fixes, ability implementations, and client effect match-up issues in the improved ability system. He also started looking at the Support Class design to determine tech requirements that need to be engineered in order to start fleshing out these classes. 6. WIP – Tech – VFX: Wylie is working on a distortion shader that supports more lighting effects. That boiled down to adding reflection and shading to the existing distortion effect. This will allow us to make convincing effects for glass, or a heat haze for a Flame Warden’s fire, or water for Wave Weaver spells. 7. 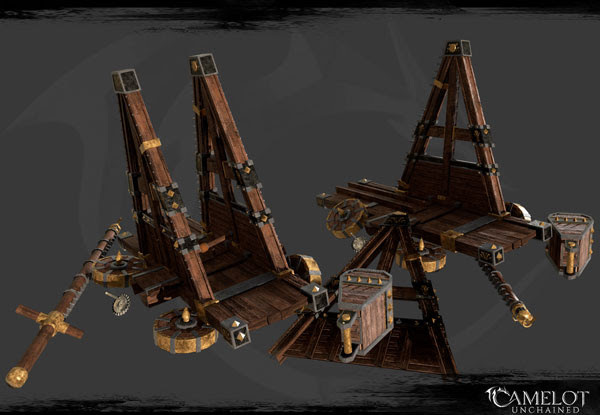 Tech – Manual Aiming: Our newest engineer, Spidey, has done some work with manual aiming on siege engines. Players should see less hitching and an overall smoother experience while aiming siege engines. Also, the magic mortar was changed so that it is now a true indirect fire weapon with a high arcing angle of attack. 8. Tech – Click Targeting: Matt landed improvements to click targeting. 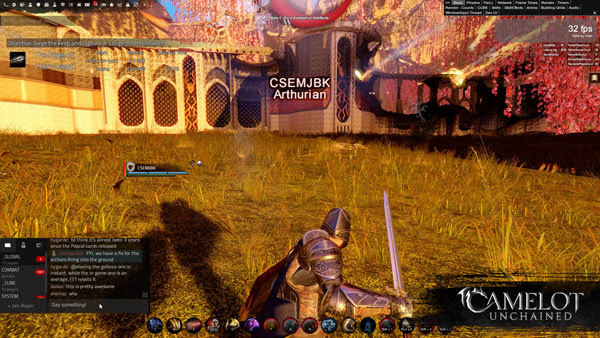 These improvements make clicking on targets in the distance less difficult and more accurate. 9. WIP – Tech – OIT Blend Materials: Dave is currently working on a blend shader to reduce the sparkly edges on assets with textures that have a transparency, such as leaves and fur. 10 Art – Siege Engines: To improve performance in the new siege scenario (which is super important when there are 200 trebuchets!) Dionne created LODs of the three magic mortar models as well as the Arthurian and TDD trebuchet models. She did a great job retaining lots of detail on the models up close, while drastically dropping their poly count at a distance. She also created two destroyed trebuchet models we can use to litter the battlefield! 11. 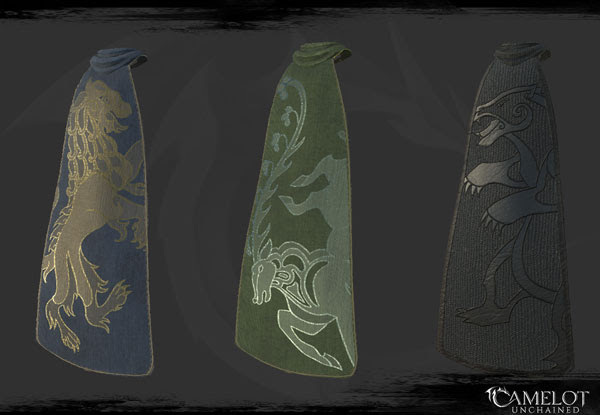 Art – Cloaks: Jon created three new materials for the current cloak models that are bit fancier, with Realm-appropriate designs. 12. 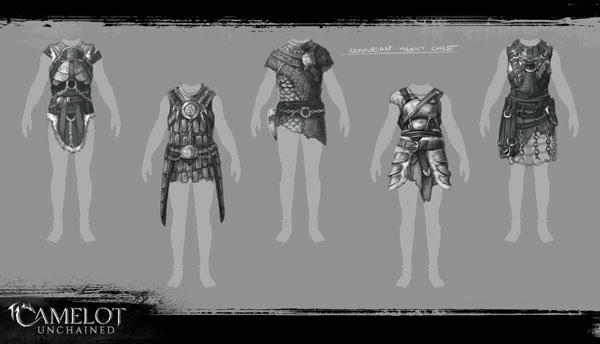 Concept Art – Realm Armor Designs: This week we focused on new heavy armor designs for the Arthurians and TDD. Our continued focus is to make gear that doesn’t look like it’s part of a set, and is more appropriate for mixing and matching, for a greater range of looks. 13. Art – Character Cleanup and LODs: Jon finished fixing all the character textures this week, removing a lot of tiny warps that could be seen on close inspection. Dionne reduced the LODs on two of the archer armors currently used in our new siege scenario to further improve performance. 14. WIP – Siege Scenario Environment: Tyler fixed several small bugs and then began rebuilding the central grass area in order to make it more interesting than the rough pass. 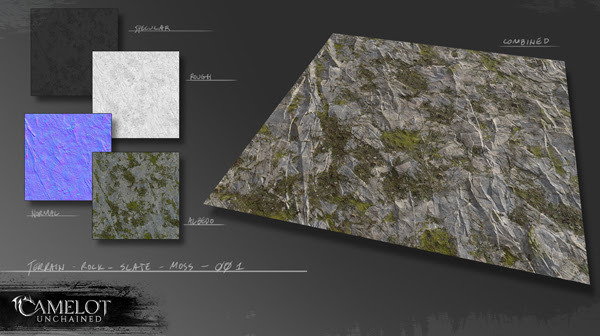 This adds more natural assets like rocks and bushes, plus broken siege engines and debris. He’ll also be working with Dionne to improve the cliff walls and statues further. a. WIP – Shields, Spears, Swords – Oh My! : Scott worked on the shared attacks for these weapons, specifically the cape and skirt animations. b. Trebuchet: Scott did a second pass of the trebuchet firing animation, focusing on more weight and accurate swinging motion. c. Scorpion: Scott fixed the Arthurian scorpion model, which we discovered was not animating properly during testing. This work also allows us to hook up the LODs to increase performance. d. WIP – Shared Longbow Set: Sandra began work on the shared set, using the Blackguard’s animations as a starting point. This improved version supports the ability system’s variable timing, and will make use of better blending in the animation system. 16. Art – FX – Siege and WIP Mages: Mike tuned the color of several of the VFX used in the new siege scenario to further differentiate them when lots (and we mean LOTS!) of abilities are laying waste to the castle. 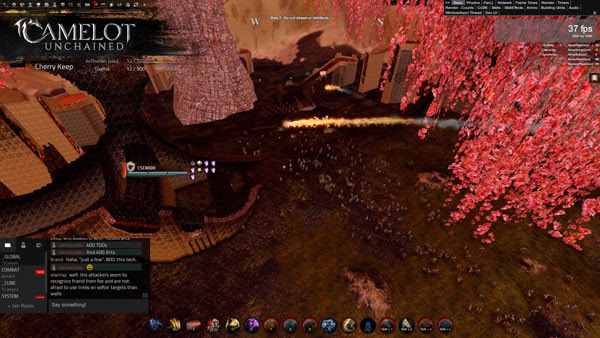 He’s also made several improvements to the new mage VFX. dB added in sounds for the magic mortars, worked on the siege SFX mix, and continued work hooking up pre-existing SFX to abilities. 17. Art – Abilities Interface: James finished the art needed for this part of the UI, and has begun breaking it up for future integration. Art this week was primarily focused on improvements to existing assets to increase performance in our siege scenario. However, we did manage to also get some new work in! 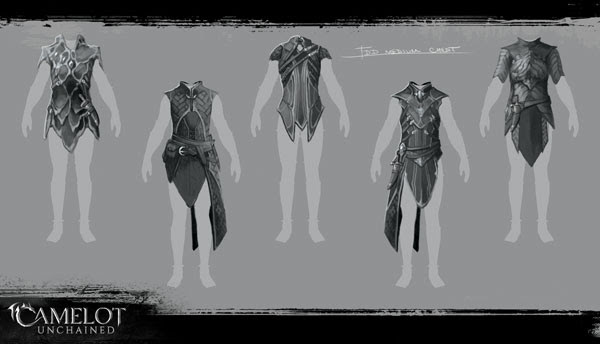 First off, we start with new cloak textures from Jon. Here’s a render of Dionne’s Arthurian Trebuchets, which have seen better days! 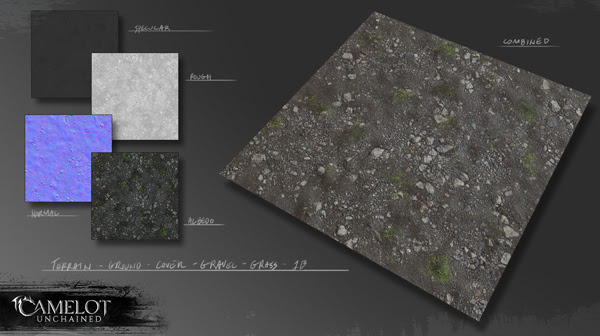 I, Tyler, have continued creating new materials for the world, like this mossy rock and gravel. Here’s a few new concepts for Viking and Arthurian torso armor. That’s all for art this week, but I don’t want to end without sharing an image of this “fun” art bug we found this week. That’s me, flying way up above the world, and that giant thing in the center of the view is actually a piece of the Arthurian scorpion geometry that has spun wildly out of control and scaled up over time. Problem-solving things like this is, for me, the fun part of game development! That’s all for this week’s update, folks. Make sure to pay attention to testing next week, as we’ll have several more changes and improvements we’ll be testing on the new siege scenario.